Ever since we moved to California, I have been completely obsessed with avocados. The avocados in Mississippi were always tiny, expensive, and either rock hard or (most often) completely rotten. The avos here are SO GOOD, so cheap and always perfectly ripe. It’s really dangerous. Like, when you eat 5 a day. Since the avocados are so good, I’ve been making a lot of Mexican inspired dishes. A couple weeks ago I got hit with either a cold or allergies. I was coughing and sniffling, and soup sounded really good. 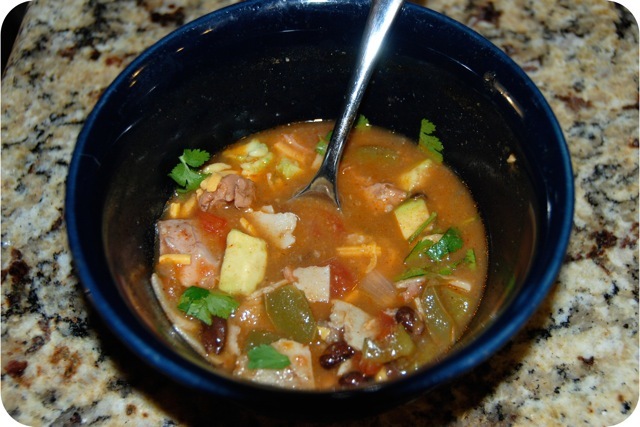 Soup that you could put delicious avocados in sounded even better. 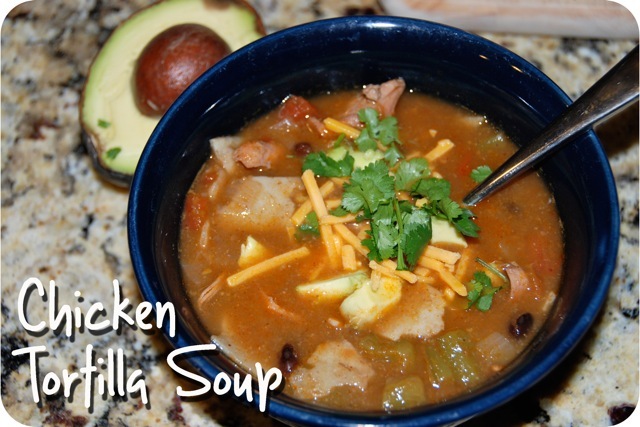 Chicken Tortilla Soup to the rescue! Preheat oven to 375 degrees. Place chicken thighs on a baking sheet and drizzle with olive oil. Mix cumin, chili pepper, garlic powder, and salt. Sprinkle a small amount of the spice mix on the chicken thighs, and set the rest aside. Bake for 15 minutes, or until chicken is done. Cool, shred chicken and set aside. Heat 1 tablespoon olive oil in a large soup pot over medium-high heat. 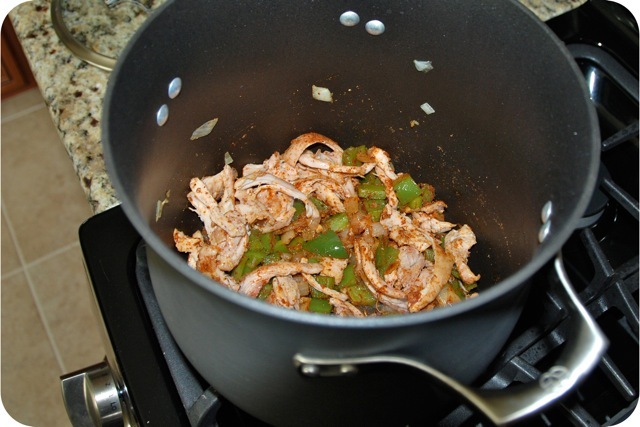 Add onion and bell pepper, and cook until beginning to soften, about 5 minutes. Add garlic and cook another minute. Add the rest of the spice mix. Stir to combine, then add shredded chicken and stir. 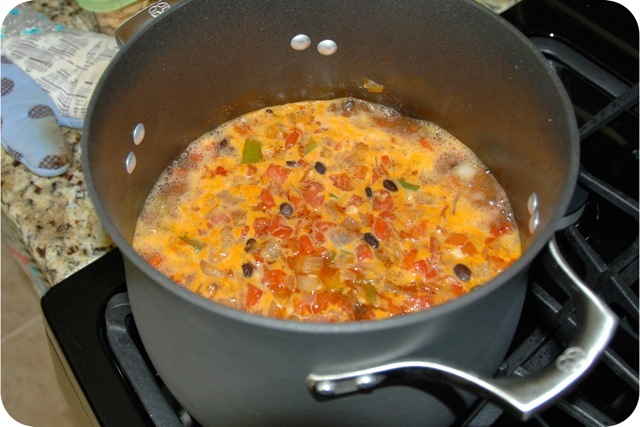 Add in Rotel, chicken stock, tomato paste, water, and black beans. Bring to a boil, then reduce heat to a simmer. Simmer for 45 minutes, uncovered. Mix cornmeal with a small amount of water. Pour into the soup, then simmer for an additional 30 minutes. Turn off heat and allow to sit for 15 to 20 minutes before serving. Five minutes before serving, gently stir in tortilla strips. Serve topped with cheese, avocado and cilantro. 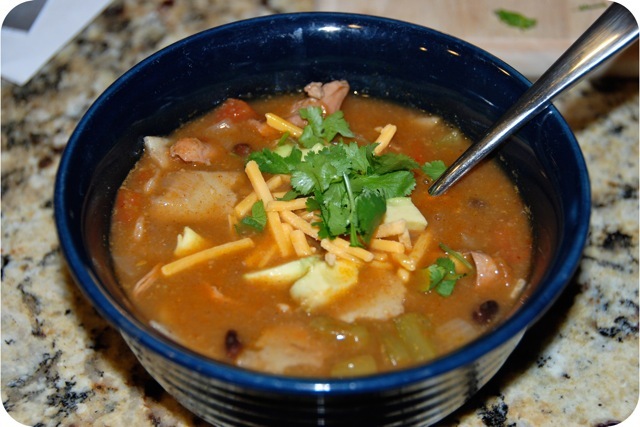 I’ve always had chicken tortilla soup with tortilla chips in it… which I’ve never been much of a fan of. They get too soggy and mushy. I LOVED the fresh tortillas in this! They got soft, but they were more like noodles than total mush. I was a fan. It even reheated pretty well. I’ll definitely be making this again!